What is a feedback forum? 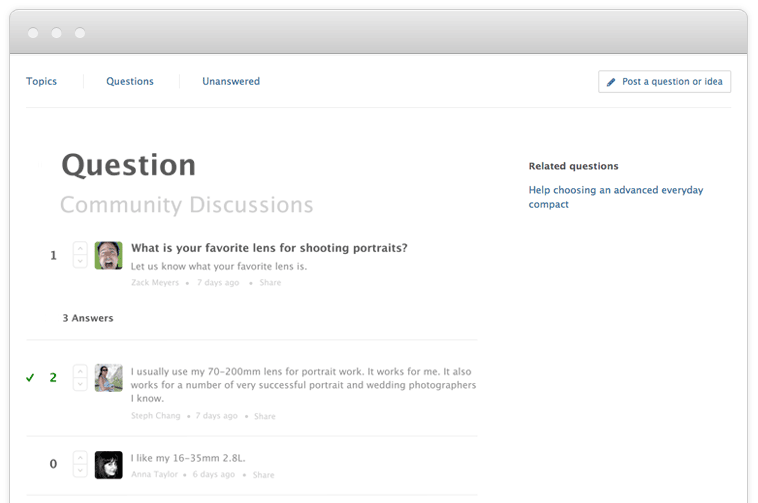 A feedback forum is an online forum setup by a company specifically for communicating and collaborating with customers. Typically built with feedback forum software or community forum software, a feedback forum allows customers to have a discussion with each other, and with companies to bridge the gap between what that company provides and what its customers want. Zendesk's feedback forum enables you to create a space for your customers to openly and productively engage with you and one another. Customers can already communicate with companies over a variety of channels. While many of these communications focus on specific support requests, some involve ideas on ways the company can improve, such as feature requests. It’s a great thing when a customer actively provides a company ways for it to improve, but channels like Twitter and email aren’t necessarily the best venue for collecting this type of feedback. Furthermore, they don’t allow customers to collaborate with one another. A feedback forum is a great way to ensure that these types of communication are happening in an organized, productive way, all in a single, centralized location. A feedback forum is a place built just for your customers. It’s a place where they can learn and talk about your product—all while strengthening their relationship with you. When done well, a feedback forum can be a fun place for your customers to further interact with your brand, and to feel like they genuinely have a stake in it. Feedback forums have the added bonus of drawing in casual customers and, through engagement, turning them into loyal customers. Of course, one of the most important benefits of providing a feedback forum is it gives you a direct line to the actual people who use your products and services. Instead of brainstorming ways to improve or solely relying on polls and other expensive tools, feedback forum software will help you collect and sort comments and posts to understand the most common requested improvements. Your customers have a lot to say. If you don’t provide them with a specific place to speak their minds, with you and each other, they’ll do so in way that is far less productive. Any company that wants to improve engagement with its customers, and help foster a mutually beneficial relationship with them should adopt feedback forum software right now. Zendesk Community enables you to create a space for your customers to openly and productively engage with you and one another. Instead of releasing ideas on how you can improve into the void of social media or an external forum, customers can provide feedback in an organized way. Community helps companies create feedback forums that improve customer engagement, collect user insight, and increase brand reach. There are many ways to learn from and engage with your customers. Keep reading to find out more!